LILONGWE, Aug 25 2010 (IPS) - The future of women’s political representation in Malawi has come into question as the ruling Democratic People’s Party (DPP) launched a smear campaign against its own member, the country’s female Vice President Joyce Banda. Many had hoped Banda would become the country’s first female president in 2014. But the campaign against Banda has proved a set-back for women’s equality and has also created a culture of fear as many of the country’s top women politicians are scared to speak publically on the matter. One female politician was even attacked for her alleged support of Banda. Female DPP Member of Parliament Anita Kalinde was assaulted by male zealots because she was suspected of being a Banda supporter. Although the incident occurred on Aug. 18, at a public function where President Bingu wa Mutharika was present, police are yet to make arrests. “They suspect that I am for Vice President Joyce Banda. I haven’t commented on what is going on in our party though,” Kalinde told the local media. The move has led right’s organisations to accuse the DPP of being discriminatory and they have demanded the party apologise to Banda and the women of Malawi. The NGO Gender Coordinating Network’s chairperson Emma Kaliya – who is also a member of President Bingu wa Mutharika’s advisory council for strategic planning – said Malawian women are being treated like second-class citizens. “The recent political happenings have raised eyebrows … we fear it is accruing to the suppression of women’s rights. This undermines the voting power of women who form the majority of the total population,” she said. Kaliya, who also champions the 50/50 campaign, decried the smear campaign against the women of Malawi. “Malawians should be reminded that the vice president’s office is the second-highest office in the country as stipulated by the Constitution. This is against the 50/50 campaign and not good for women who are vying for political positions,” said Kaliya. Malawi developed the 50/50 campaign in 2008 in response to the Southern African Development Community Gender and Development Protocol which commits countries to work towards the goal of having 50 percent women in political and decision-making positions by 2015. Banda was running mate to President Mutharika in the 2009 presidential polls, which saw them win the election. 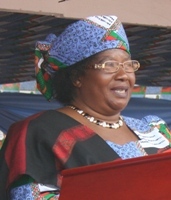 This was the first time Malawi had a female vice president since it attained independence in 1964. But top DPP official and the party’s regional governor for the South, Noel Masangwi, told the local media on Jul. 29 that Malawi is not ready to be led by a woman. A regional governor is the highest party authority in a province – Malawi has three regions and the South is the biggest. “All I am saying is that Malawi is not ready for a woman president. The vice president might have had such ambitions, but I am sorry to say this,” said Masangwi. His comments are in spite of the fact that the 2009 national government elections saw the number of women represented in parliament increase from 14 to 22 percent. The DPP leadership, including President Mutharika, has not spoken against Masangwi’s comments. Instead, Mutharika’s younger brother, Peter, who is also minister of education, is being propped up by the party’s top leadership to take up the presidential mantle when his brother’s term of office expires in 2014. Malawi’s presidents are barred by the country’s Constitution to serve for more than two terms of five years each. The campaign against Banda seems to be gaining momentum with each passing day. The smear campaign is being broadcast through the national radio and TV stations of the Malawi Broadcasting Corporation (MBC), which is state controlled. Top management at the MBC have openly declared in live TV and radio broadcasts that Peter Mutharika is a better presidential candidate than Banda. Malawi’s president appoints the top management of the state broadcaster to their positions. Meanwhile Banda told local media that the campaign for the president’s brother was laughable. “What others are doing has shown a clear indication of desperation and panic on their part,” Banda said. She has since indicated that she will declare her position for 2014 when the time was ripe. “I won’t comment further on what is going on. Let people speak on the matter,” said Banda. When she was nominated as Mutharika’s running-mate in 2009, Banda said she had been fighting a hostile environment as a female politician. “I have had to learn how to navigate and find my way. People have seen my performance as a member of parliament. I am not emotional but solid and realistic. I have done my best as a cabinet minister and I will prevail in any political, social and economic storm,” said Banda. Banda served as gender minister and also as foreign minister before she became vice president. Grace Kamanga, one of the women who always sings and dances at DPP political rallies, worries that the state of affairs in the ruling party is working against the 50/50 campaign. Women dancers are a major part of any political party in Malawi since no political meeting takes place without song and dance. Songs are composed and sung in praise of the party leadership and in praise of the president. “We were getting geared up to dance for a female president in 2014 for a change but now it looks like we are not going to be allowed that pleasure,” said Kamanga. President Mutharika declared in October 2009 that his brother is free to run for any public position. “I want to make it very clear that Professor (Peter) Mutharika has a right to hold any position or to campaign for any position in this country like anybody else,” he had said.